Every time I put nail polish on my daughter I have to sit there and blow on it for what seems like forever. It takes forever to dry and then as soon as she gets up and walks around it's chipped... Sound familiar??? 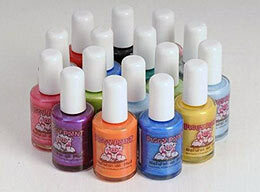 Enter Piggy Paint The All natural, Non toxic Nail polish and Remover. And to top it off It's WATER BASED!! From their Website: Say good-bye to harsh, smelly chemicals and hello to Piggy Paint™…it’s as Natural as Mud! We just tested out Piggy Paint for this review and It's amazing!! We tried out the Forever Fancy Piggy Paint and It's a beautiful color. On my daughter's toes it's almost more of a hot pink, but for a 2 yr old that's fantastic!! So She already had some old polish on her toes and I decided to try the Nail Polish Remover. It had No Harsh smells, and In fact it was Odorless!! It worked like a charm and took off her old polish in No time. It was really a great product. And the best part was that I only used 2 cotton balls and It will last a while! Then I painted her Piggies with the Forever Fancy polish. I LOVE this nail polish. It also has no harsh smell. It's not runny so I got the excess off and painted away. I was able to do her whole foot on 1 brush full of paint!!! YAY! No re dipping, which also means that this will last a while. Granted her toenails are Small, but that's not the point, And I know I won't be using HOT PINK nail polish any time soon. So this is all for her. Now It dried in about a minute time. It was quick, easy, painless and She was up and running within 3 minutes! She loved that it didn't take long, and I loved that it was easy. No mistakes were even made. And she's been running around and there's no chipping involved!! I love that. It's a Very Thick Durable Nail polish! Another thing I Liked is that when I was using the Polish Remover on Avery It didn't dry out my Hands and nails, like regular polish does. I loved that!! Price: $8.99 for the nail polish and $8.99 for the Remover as well. These are down from $9.99 for the polish and $10.50 for the remover. It's time to stock up! I would get candy coated and girls rule! I am following your blog #3. Thank you. Breast Cancer Pink is cool!! Thanks for the chance. I would get Forever Fancy and some nail polish remover! I'd buy the remover and Ice Cream Dream. I love the Dragon Tears shade, thanks! Girls Rule is my fav! I would get the Mac-n-Cheese Please color! I would get the Angel Kisses nail polish! My three girls would love to wear Girls Rule! I would like the girls rule polish. Why all the Capitalized Words randomly strewn throughout Your BLOG?